MTR’s Rasam Rice is a delicious South Indian soup or curry mixed with rice. Rasam is mildly sour and is prepared with tomatoes, tamarind water, coriander leaves and lentils. 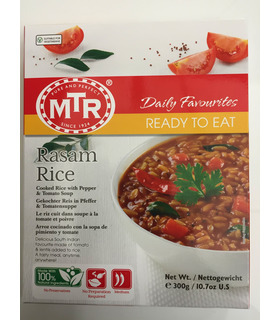 This quick and easy finished meal from MTR lets you enjoy the authentic taste of Rasam rice with a ‘just-cooked’ freshness. Serve it with MTR’s Sambar curry for a complete, vegetarian, South Indian meal in minutes. Spice level MTR’s Rasam Rice is medium spicy. Preparation Immerse the inner unopened pouch in boiling water for about 5 minutes. Remove, cut open and serve hot. Or empty the contents in a bowl and microwave it for 1-2 minutes and serve hot. MTR’s Ready-To-Eats are natural, preservative-free and 100% vegetarian. 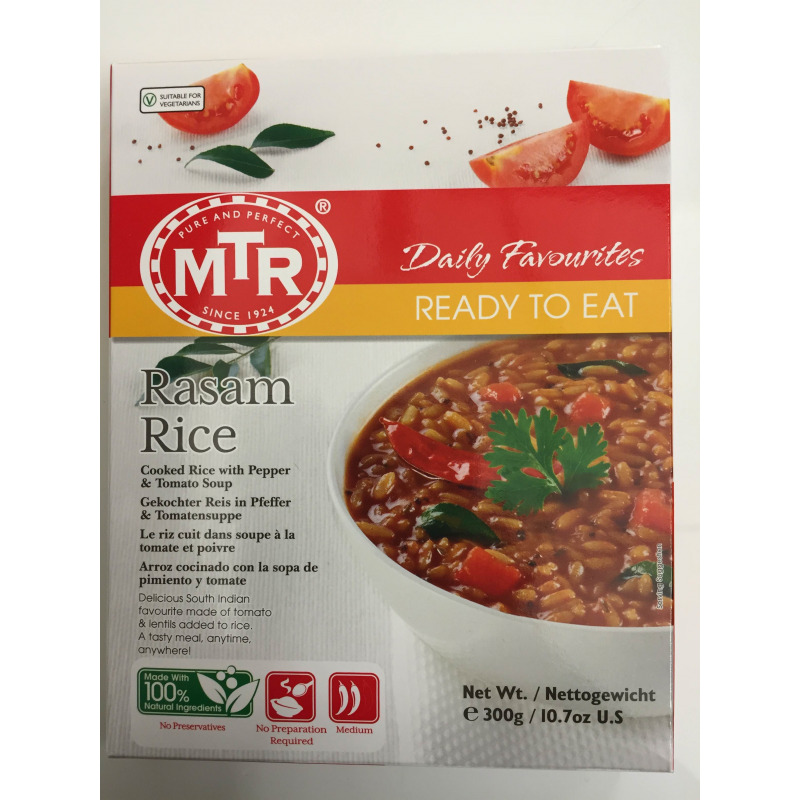 MTR’s Rasam Rice is a delicious South Indian soup or curry mixed with rice. Rasam is mildly sour and is prepared with tomatoes, tamarind water, coriander leaves and lentils. This quick and easy finished meal from MTR lets you enjoy the authentic taste of Rasam rice with a ‘just-cooked’ freshness. Serve it with MTR’s Sambar curry for a complete, vegetarian, South Indian meal in minutes. MTR’s Rasam Rice is medium spicy. Water, Rice 8%, Tomato Puree, Tamarind Juice, Red Gram Dal, Spices 1.4%, Jaggery, Salt, Ghee, Coriander Leaves, Mustard, Asafoetida, Curry Leaves.